MANILA, Philippines – With Undas now underway, many Filipinos have already begun their yearly journey by land, sea and air to visit their departed family members in their respective provinces. 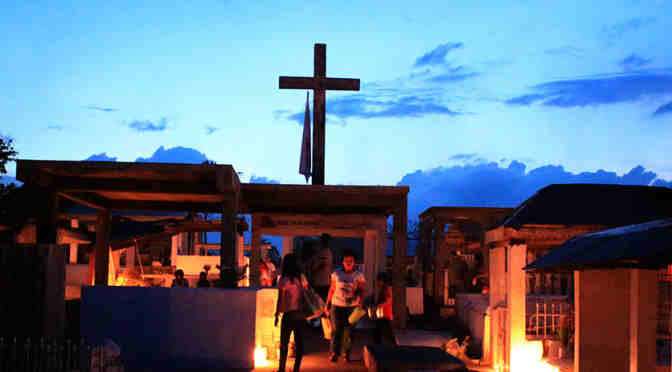 To make this year’s observance of Undas more organized, several government agencies, media, and private companies have turned to Twitter to issue news advisories and tips for the benefit of Filipinos celebrating this religious tradition. And as a live platform, Twitter has become a real-time source for Filipinos to find and share important information about the impact of #UNDAS2017 on public safety and traffic. As millions more will be flocking to the different cemeteries in the next few days, Filipinos travelling to the final resting places of their departed should check out the Twitter accounts of key resources that provide latest updates on traffic and transportation conditions, as well as public safety announcements. Those traveling by car should expect heavy traffic because of the holidays and check the Twitter accounts of major tollway operators such as @SkywaySOMCO, @officialSLEX, NLEX and Star Tollway handle for any vehicular accidents or traffic updates. Motorists should also check the official Twitter account of the Metro Manila Development Authority (@MMDA) for alerts on number coding and road closures. The Ninoy Aquino International Airport (NAIA @MIAAGovPH) has been inspected for Undas-readiness and their Twitter account contains news about flight and airport conditions so those traveling by air may know if any disruption to their travel should be expected. The Philippine Coast Guard (@PhilCoastGuard1) monitors and reports passenger traffic in ports and sea conditions so those taking boats and ferries to their destinations should first check travel guidelines for safety and convenience. Several companies also pitched in to ensure the safety of #Undas2017. Motorists could check out the Twitter accounts of the top gasoline companies in the Philippines @CaltexPH, @Petron_Corp, and @Shell to find out the nearest petrol stations along their route and avoid running out of fuel in the middle of their journey. 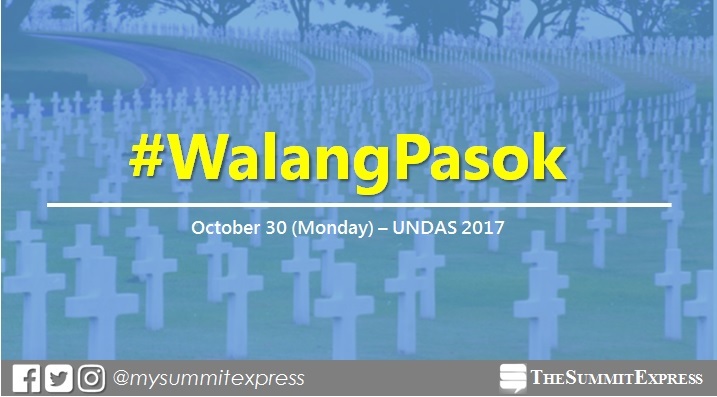 With several sources of live Undas-related news updates on Twitter, Filipinos can have a smooth-sailing journey towards a more meaningful #UNDAS2017. MANILA, Philippines - State weather bureau PAGASA is monitoring a Low Pressure Area (LPA) which affects parts of the country on "Undas" holidays. In the weather forecast as of 3:00 p.m. on Tuesday, October 31, PAGASA said the LPA was estimated based on all available data at 60 km South Southwest of Masbate City, Masbate(11.9N, 123.4 E). The LPA triggers cloudy skies with scattered rains and thunderstorms over the areas of Visayas, Bicol Region and the provinces of Marinduque, Romblon and Mindoro. Meanwhile, northeast Monsoon is affecting Northern and Central Luzon as well as Metro Manila. MANILA, Philippines - Some local government units announced class and work suspensions for Monday, October 30, 2017, ahead of the nationwide holidays on October 31 and November 1. The local declaration gives more time for the families to prepare for the observance of All Saints Day and All Souls' Day (Undas 2017). On Sunday night, Manila Mayor Joseph Ejercito Estrada announced that classes in all levels, public and private, as well as work in government offices in the City Hall have been suspended on October 30 (Monday). The announcement excludes the departments of the City of Manila which are in charge of health, engineering, traffic, disaster management and public services. In addition, Estrada added that suspension of work in private offices will be at the discretion of their management. Note: The suspension of work does not cover other government offices outside Manila City Hall such as PRC, SSS, Supreme Court, LTO and GSIS unless they have their own announcement for the suspension on office work. The Metro Manila police are also preparing for heavy traffic and large volume of people going to cemeteries in observance of the holidays. According to the Manila Police District (MPD), around 1,300 will be deployed in four of the biggest cemeteries: Manila North Cemetery in Sta. Cruz, La Loma Catholic Cemetery, Manila Chinese Cemetery, and Manila South Cemetery. Note: This is a developing story. Help us crowdsource class suspensions by sharing in the comments section or tweeting @mysummitexpress. MANILA, Philippines - The youth will play a crucial role in the future of the country’s economy with 70 percent of the Philippine population aged below 30. The Department of Trade and Industry (DTI) recognizes by identifying young entrepreneurs as the nation’s hope. However, reforms must be made in the educational system to help them reach their full potential. “If we want to make smarter entrepreneurs, we should start by changing the mindset of the young through the establishment of entrepreneurship education,” Sec. Ramon Lopez, Chairperson of the DTI said. CHED Chair, Dr. Patricia B. Licuanan (center) with (from lef)t Senior Program Coordinator for the Women and Gender Institute of Miriam College Prof. Aurora De Dios, Miriam College President Dr. Rosario O. Lapus and Educational Innovation and Skills Development (EISD) UNESCO APEID Bangkok Chief Mr. Libing Wang, and 6th UNESCO APEID Meeting on Entrepreneurship Education Chair, Dr. Antonio M. Lopez. Sec. Lopez posed this challenge at the 6th UNESCO-APEID (Asia-Pacific Programme of Educational Innovation for Development) Meeting on Entrepreneurship Education held in Manila. The three-day conference brought together delegates, educators, and policy makers from UNESCO, DTI, and the Commission on Higher Education (CHED) to discuss how to advance youth entrepreneurship in the Asia-Pacific region. He specified the steps needed to achieve this goal and highlighted the importance of the youth’s role in national development. “The way to foster an entrepreneurial mindset is establishing a more advanced ecosystem, policies, and programs for competence building. That is what this meeting is all about: establishing an innovative entrepreneurship education that would reshape the mindset of the youth towards the journey of entrepreneurship,” Sec. Lopez said. To be aligned with ASEAN’s developmental goals, government policies must be formed to support young entrepreneurs and their businesses. The approval of Republic Act No. 10679, also known as the Youth Entrepreneurship Act, was a step forward in this direction. “With this law, government agencies like DTI, CHED, the Department of Education (DepEd), and the Technical Education and Skills Development Authority (TESDA) are obliged to develop and promote entrepreneurship and financial literacy among the youth,” Sec. Lopez said. Part of CHED’s efforts in preparing future entrepreneurs is to form them into tech-savvy individuals through the implementation of a mandatory 3-unit elective on Technopreneurship included in the New General Education Curriculum that takes effect in 2018. “In early 2015, CHED inked a memorandum of understanding with the Philippine S&T Devolopment Foundation Manila Inc. (PhilDev S&T) with the goal of producing Filipino engineers who can transform their ideas and innovations into economic enterprises,” Dr. Licuanan explained. Dr. Licuanan’s speech highlighted the opportunity to further support the vital role of women in economic development. “An international study on entrepreneurship revealed that 70 percent of small and medium-sized enterprise (SME) start-ups in the Philippines are led by women,” she stated. MANILA, Philippines - As expected, Christian Standhardinger was chosen number 1 overall pick by San Miguel Beermen (SMB) in the 2017 PBA Rookie Draft event on October 29 at Robinson’s Place Manila. Prior to the start of Ginebra-Meralco sudden death Game 7, Commissioner Chito Narvasa approved the proposed trade between Kia and SMB where the Beermen will have the 1st pick of this year’s Rookie Draft while Picanto will have Rashawn McCarthy, Jay-R Reyes, Ronald Tubid and SMB’s 2019 1st Round Pick. The trade garnered different reactions from the fans and some of the PBA players. Even the approver, Commissioner Narvasa himself didn’t avoid the criticism. But newly appointed Team Manager, Joe Lipa, defended the team’s decision on letting go of their precious pick to fortify Kia Picanto in the league’s standing. Lipa stated that 3 players are better than one and a single player can’t make the team better. He also highlighted his new players’ strength specifically Jay-R Reyes, a big man who can run and score from the outside. As the annual Philippine basketball event started, Commissioner Chito Narvasa has officially opened the 2017 Rookie Draft and the San Miguel Beermen has officially picked the 6’8” Fil-German Christian Standhardinger. Standhardinger has proven himself to be a top scorer and tough defender during his Gilas Pilipinas tenure. Playing alongside with the 4-time MVP June Mar Fajardo will give SMB another chance to win more titles. 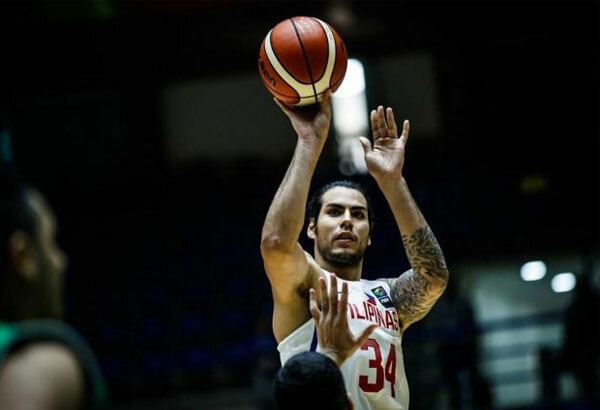 However, Christian Standhardinger will not be available this coming All-Filipino Cup as he has just signed a 6-month contract for the Hong Kong Eastern Long Lions in the ABL. NLEX Road Warriors on the other hand selected King Eagle Kiefer Ravena. During the the Governor’s Cup eliminations, Coach Yeng Guiao expressed his intention to get Ravena that will bring depth to his backcourt. On pick number 3, Blackwater Elite opted for a big men in person of Reymar Jose who will complement its current center Poy Eram. Jason Perkins went to Phoenix Fuel Masters at the 4th pick. While Alaska Aces chose Jeron Teng at the 5th spot. Perkins and Teng both played for De La Salle University and won a championship together. Jeron Teng who’s a legit scorer, will definitely help the Aces improve their standing come Philippine Cup opener next month. PBA D-Leaguer Robert Herndon Jr. was selected by Globalport Batang Pier at the 6th pick and Rain Or Shine obtained Letran Knight Rey Nambatac for pick number 7. For the 2nd time and for the 8th pick, Phoenix Fuel Masters chose a big man: Sidney Onwubere who stands at 6’5”. The former Emilio Aguinaldo General is expected to bring more firepower to his new team. Lervin Flores went straight to Star Hot Shots for pick number 9. Coach Chito Victolero opted for a big man who can back-up veteran Jean Marc Pingris and Ian Sangalang. Unheralded Mark Tallo joins TNT Jayson Castro and Roger Pogoy in the backcourt while 6’5” Jon Gabriel joins Moala Tautuaa and Kelly Williams in the front court for the 10th and 11th pick respectively. Governors Cup Champions Barangay Ginebra picked former UP Maroon and gunner Jett Manuel for the last pick of the 1st round. Surprisingly a handful of notable draftees went teamless on the 1st round. The likes of Davon Potts, Julian Sargent, Biboy Enguio and Joseph Gabayni were still hopeful to be on any team come 2nd round. Among the 44 draft hopefuls, Jeremiah Dela Pena was the only draftee who was not selected. The Rookies will undergo rigorous training under their new teams and will fight for roster spots that will ensure them long-term contracts. MANILA, Philippines - A Grab driver who once went viral for helping a passenger undergoing dialysis, was shot dead by unidentified suspects who posed as regular passengers. The ride-hailing platform company on Saturday, October 28, condemned the ruthless act and said that investigation is underway. Grab driver Gerardo Amolato Maquidato Jr was once hailed as a “model driver” for giving a free ride to a passenger who was on her way to pick up a bag of blood for her dialysis. The passenger, unfortunately, died but her family was able to thank Maquidato in person. Grab even awarded Maquidato for his compassionate service. But sadly, such compassion is indeed rare in this world, for “good samaritan” Maquidato was mercilessly shot dead on Thursday night, October 26. According to police reports, a witness heard a gunshot at around 7:50 in the evening on Thursday. A lifeless body was then seen being pushed out of a silver Toyota Innova as the unidentified suspects sped away using the vehicle. It was Maquidato’s nephew, Rex Mer Solitario who first posted online about the incident. Grab Philippines released a statement confirming that Maquidato is a Grab driver. This prompted Grab to coordinate with the Philippine National Police - Highway Patrol Group to heighten their security as there has been a noted increase in the number of incidences of carnapping among Grab taxis. Ginebra wins back-to-back Governors Cup titles! MANILA, Philippines - The Barangay Ginebra San Miguel is your 2017 PBA Governors’ Cup Champions! Ginebra survived Meralco’s late scary run in the final canto as they sent the Bolts home, 101-96 on Friday, October 27, 2017 at the Philippine Arena in Bocaue, Bulacan. This is it! Meralco vs Ginebra in a do-or-die game, win or go home! Good sign for Ginebra as they bucketed the first basket followed by a Meralco turnover and a long three pointer from Justin Brownlee. Ginebra clogged the shaded area to prevent Allen Durham from muscling his way up and limit the Bolts to shoot from the lower percentage angles. Despite the glue-tight defense, Meralco managed to stay close with Ginebra in the early phase of the opening quarter. Ginebra looked scary in the first period as the Kings drained multiple treys and scored a handful in the paint. In contrast, Meralco started to shoot blanks and committed more turnovers which Ginebra converted into fast break points that lead to 27-19 advantage after the first 12 minutes. Barangay Ginebra continued to rain threes and block shots as they began the 2nd period. To his dismay, Coach Norman Black immediately called a timeout to stop the bleeding. In Spite of the timeout, Ginebra still surged and Meralco kept on missing. Worried and anxious, Coach Black burned another time out to find a solution to Ginebra’s unstoppable offensive onslaught. Reynel Hugnatan ended the scoring dry spell in the 4-minute mark as he sank a floater. However, the Bolts trailed 19 big points with plenty of time remaining before the half ended. Jared Dillinger was the only brave Bolt who kept on fighting until the 1st half wrapped up as he managed to cut the lead to 15, 52-37. Dillinger unleashed 11 points while veteran Ginebra guard LA Tenorio topped all scorers with 13 at the halftime break. Allen Durham, this conference’s Best Import might have met his kryptonite. “The Hulk” surprisingly jotted only 6 points as he entered the third. Durham even got blocked multiple times and had butterfingers that cause turnovers. In the contrary, Ginebra got nothing but all good looks in all sides of the floor whether from the inside or outside. Barangay escalated its lead to 20 with just 2 minutes gone by in the beginning of the 3rd period. Allen Durham who was an obvious sleeper in the first half completed a dunk and one plus a triple as a retaliation to Ginebra’s scoring barrage. Fact, Allen Durham’s triple at the 8-minute mark was his first in the series after 18 attempts. LA Tenorio was simply uncontainable in this game. The former Ateneo Eagle already had 21 point with 14 more minutes to go in the ballgame. His fellow alumnus Chris Newsome however, had a bad night with only 4. Tenyente Tenorio closed the third with another jump shot for the 81-64 lead. 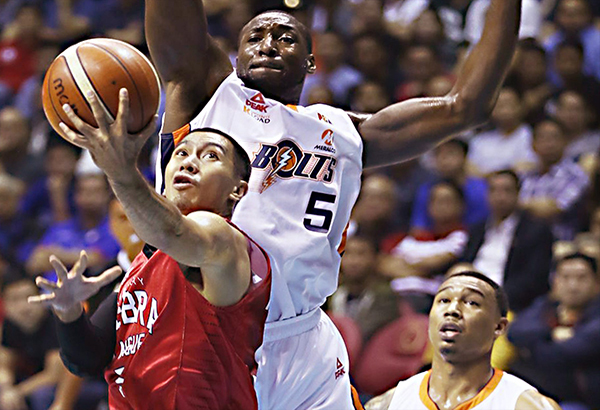 The Bolts somehow got closer to Ginebra and was able to lower the lead to just a dozen, courtesy of guards Anjo Caram and Baser Amer. But Meralco couldn't really get its momentum. Every time Meralco had a run, it will only be momentarily as Ginebra promptly fired back. Anjo Caram’s 2 fast break points broke the Ginebra double-digit lead and placed his team behind by just 9 points with over 4 minutes remaining in the game. Coach Tim Cone, bothered by Meralco’s run, requested for a ceasefire to talk things over. The 2-minute warning was announced by the coliseum barker with Meralco’s hope in winning the crown was slowly dimming as Ginebra’s lead was escalated to double figures anew. With 71 ticks remaining in the ballgame, Cliff Hodge got fouled out and Ginebra’s lead was 7, 100-93. Jared Dillinger’s three pointer cut the lead to just 4 with 40 seconds left in the game clock. Meralco posted a 7-0 blitz and saw a tiny chance of upsetting Ginebra. Meralco had its chance but it was too late. At the final horn, Barangay Ginebra ended the series 4-3 with a nail-biting 101-96 win over the brave Meralco Bolts in front of 54,086 die hard PBA fans. 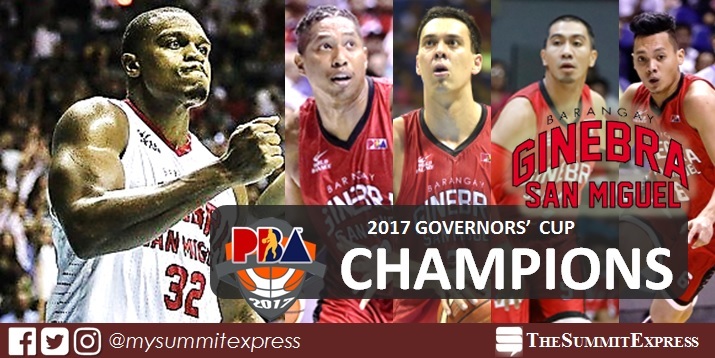 On behalf of The Summit Express, we congratulate the Barangay Ginebra for winning the 2017 Governors Cup Finals for the 2nd straight. Never Say Die! MANILA, Philippines — Will the Kings clinch a historic title repeat or the Bolts win a breakthrough championship? UPDATE: Ginebra wins back-to-back Governors Cup titles! The Barangay Ginebra and Meralco squads are in grudge match tonight, October 27, 2017 for the Game 7 of the PBA Governors' Cup Finals series at the Philippine Arena in Bocaue, Bulacan. Ginebra supporters who have previously dominated attendance at the world's biggest indoor arena are expected to flock again setting a new record for a PBA game, including the Finals, in the history of the 42-year old league. The final battle which is set at 7:00 p.m. will be suspense-filled with both team hungry for the elusive title. "Truly it is. There's nothing more exciting or suspense-filled than playing in a Game Seven. The best thing that you can do is to enjoy the opportunity. That's really the best approach," Ginebra coach Tim Cone shared on PBA.ph website. "We're now in the same situation as they are -- one game to end the season. We just have to find a way to keep our guys fresh and come back to win the championship Friday," said Meralco coach Norman Black. Black said his team will rely again on the Magnificent 7 which includes two-time Best Import Allen Durham, Reynel Hugnatan, Chris Newsome, Garbo Lanete, Jared Dillinger, Amer Baser and Cliff Hodge. MANILA, Philippines - The full list of topnotchers or top 10 passers for October 2017 Electronics Engineer (ECE) and Electronics Technician (ECT) board exam is available on this page as officially released on Friday, October 27, 2017 or in four (4) working days after the exam. Dino Dominic Forte Ligutan from De La Salle University (DLSU) - Manila topped the board with 94.40%. It was followed by Willard Joshua Decena Jose from the University of the Philippines (UP) - Diliman with 93.40%. The Professional Regulation Commission (PRC) conducted the licensure exam in the cities of Manila, Baguio, Cagayan de Oro,Cebu, Davao, Lucena and Tuguegarao on October 21 and 22 for ECE and October 23 for ECT. In the October 2016 ECE board exam, Masaru Quemquem Nakaegawa from University of Santo Tomas (UST) topped the board with 92.30%. Meanwhile, University of the East (UE) - Caloocan graduate Ronnel Padiernos Dayawon, Hexina Espiritu Madolid from De La Salle University (DLSU) - Dasmarinas and Voncarlo Giovanni Dideles Pasco from Technological University of the Philippines (TUP)-Visayas got the highest place in the October 2016 ECT board exam. In the October 2015 ECE board exams, Emiliano Marcelo Tan from the University of the Philippines (UP) - Diliman got the highest grade of 91.20%. Rannie delos Santos Salvador of Bulacan State University (BuLSU) garnered the highest grade of 93.00 for the ECT boar exams. Monitor this page for the real-time updates on Electronics Engineer board exam results. Check out also the official website of PRC for more information. MANILA, Philippines — The October 2017 Electronics Technician (ECT) board exam results including the official list of passers, topnotchers (top 10), top performing schools and performance of schools are released on Friday, October 27, 2017 or in four (4) working days after the last day of exam. 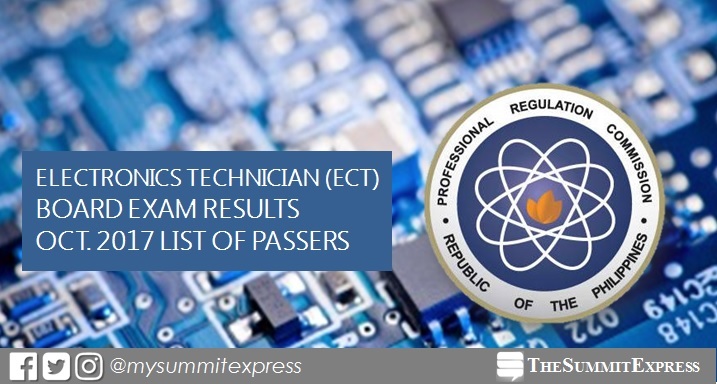 UPDATE: 2,916 out of 3,258 passed the Electronics Technician (ECT) Licensure Examination. The Professional Regulation Commission (PRC) conducted the ECT licensure exam in the cities of Manila, Baguio, Cagayan de Oro,Cebu, Davao, Lucena and Tuguegarao on Monday, October 23, 2017. PRC also conducted the Electronics Engineer (ECE) board exam on Saturday and Sunday, October 21 and 22. From November 3 to 8, registration for the issuance of Professional Identification Card (ID) and Certificate of Registration will be done on-line. Please go to www.prc.gov.ph and follow instructions for initial registration. ECT board exam's verification of ratings (passers, non-passers and removal) can be done online. The October 2017 ECT board exam covered the technical subjects, laws and ethics: basic mathematics, Ohm's Law, Electronic/Electrical Machine or equipment, test equipment, electronic/electrical component, maintainance and repair, Philippine electronics and electrical codes and R.A. 9292 or the Electronics Engineering Law of 2004. Based on PRC Resolution No. 2016-1019, the target release of results for the recent ECE board exam is on Thursday, October 26 or in 3 working days after the last day of exam. In the same period last year (October 2016), PRC announced results in three (3) working days after the exam. A total of 2,722 out of 3,642 (74.74%) passed the tests. In October 2015, results were also released in 3 working days. PRC named 2,984 out of 3,518 (84.82%) who have passed the exams. Monitor this page for the real-time updates on ECT board exam results. Check out also the official website of PRC for more information.